“This book will change your life.” A 5 Star review for Leg Ulcer Treatment Revolution. This is the latest review on Amazon, for the latest book written by Mark Whiteley. After watching a loved one suffer for many years with leg ulcers and the pain and inconvenience of dressings etc this book really did shed light on the revolutionary procedures which really work.. its informative but in layman’s terms and will give you hope when you have nowhere else to turn .. I cannot recommend it enough ! Venous leg ulcers are now curable by local anaesthetic endovenous surgery. In the past, they were “treated” by dressings and compression. However, the latest research shows that endovenous surgery heals ulcers quicker than compression, and reduces the risk of them returning. This has been the approach adopted by The Whiteley Clinic for years. In 2013 we published our 12-year results showing we cured 85% of venous ulcers permanently (see paper). 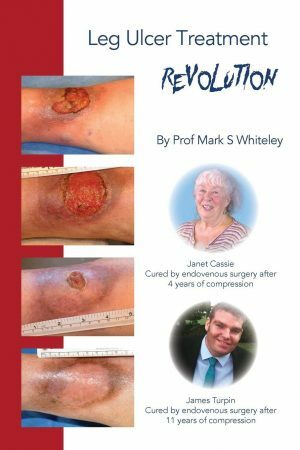 Frustrated by the lack of change in the medical and nursing community, Prof Mark Whiteley has now published “Leg ULcer Treatment Revolution”. This review says all that needs to be said!